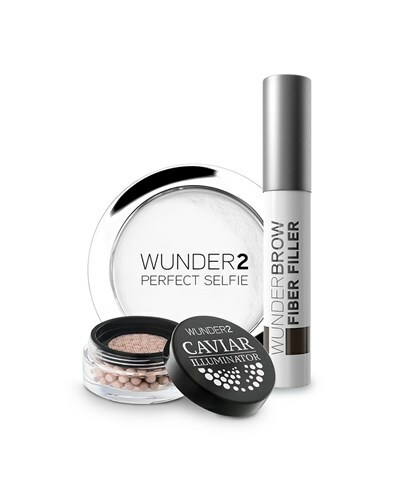 Description Receive 20% discount on this special WUNDER2 SUMMER COMBO & get one of each of WUNDERBROW FIBER FILLER, PERFECT SELFIE HD PHOTO FINISHING POWDER & CAVIAR ILLUMINATOR. SUMMER is all about fresh & natural-looking skin. Create beautiful, bushy brows, glowing cheekbones & perfect skin with our Spring Combo. Here’s how: 1. BROWS Start with a clean, dry brow. Simply swipe WUNDERBROW FIBER FILLER through the brow with the applicator. One-swipe & you will have fuller, bushier brows that look completely natural. Choose from our Blonde, Brunette, Auburn & Black/Brown shades. 2. HIGHLIGHT Take a small amount of CAVIAR ILLUMINATOR from the mesh with your finger and gently tap on cheeks, eyes or décolletage. Feel free to apply additional for a more blinding glow! 3. FINISH Apply PERFECT SELFIE Powder all over the face with a brush after makeup application and buff in circular motions. You will be left with a makeup look that is poreless, free of fine-lines and smooth without camera flashback.